Established to commemorate the spirit of the fund raising initiative by Austin George (Jim) and Mary Roessel Engel, Robert A. Morgan and their fellow Macalester students that in 1949 created Macalester’s Displaced Person Scholarship and brought Oleg Jardetzky to Macalester and the United States. 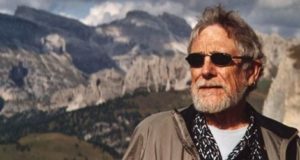 Macalester will host “Environment and Poetry” reading by Gary Snyder as the 2018 Engel-Morgan-Jardetzky Distinguished Lecturer. Gary is an internationally renowned poet, environmentalist, Zen Buddhist, and educator. Originally part of the Beat movement with Allen Ginsberg, Jack Kerouac, Lawrence Ferlinghetti and others, he has written more than 20 books of poetry and prose, including Riprap & Cold Mountain Poems, No Nature, Rivers and Mountains without End, The Practice of the Wild, and This Present Moment: New Poems. He received the Pulitzer Prize for Poetry for Turtle Island. Other awards include the American Book Award, the Bollingen Prize for Poetry, the John Hay Award for Nature Writing, and Ruth Lilly Poetry Prize. We are very honored to host this public event. There will be a Q & A and book sale after the reading. Free and open to the public, but tickets are required. Tickets will be available to the Macalester community (one ticket per student, 2 tickets per staff or faculty) and general public (Limit two tickets per person) starting October 1 at the Macalester Campus Center Information Desk or by will call. For will call reservations contact JardetzkyMac2018@gmail.com.